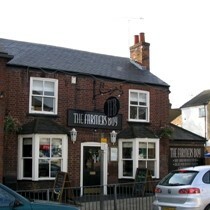 The Farmers Boy in St Albans is a traditional pub half way up London Road. It is the home of the Alehouse Brewery and brews Farmers Joy and Alehouse Clipper IPA. The Farmers Boy also offers a couple of guest beers that often includes Timothy Taylor Landlord and London Pride. Good friendly service and nice atmosphere. Great real fire. Wood floor. Quiet background music. Smart clean country style pub with seating for around fifty. Home-made food available during the day and in the evenings until 8pm on weekdays. Live music every Thursday evening and quiz nights on Wednesdays.